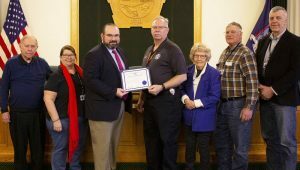 OSWEGO – The Oswego County Legislature’s Public Safety Committee recently presented Oswego County Fire Coordinator Donald Forbes a certificate of appreciation for 10 years of service as Fire Coordinator. The agency conducts training programs in various techniques of fire suppression for volunteer firefighters, career firefighters, and industrial fire brigades, and oversees special operations and fire investigative teams. Pictured from left are legislators Milferd Potter, District 2, Orwell; Mary Ellen Chesbro, District 10, Pennellville; committee chairman Terry Wilbur, District 21, Hannibal; Forbes, Margaret Kastler, District 1, Sandy Creek; Richard Kline, District 12, Phoenix; and committee vice chairman Bradley Trudell, District 7, Mexico.